DSi downloadable content to rival iPhone app store? 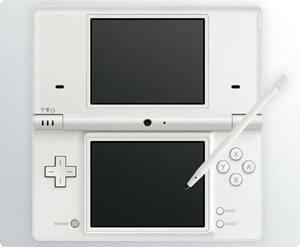 While it has been known for a while that the Nintendo DSi will offer downloadable mini games to play off the machine’s flash memory with a shop like the Wii’s, it appears Nintendo has plans for content beyond gaming for the download service in a move that bears more than a passing resemblance to what Apple have done with the iPhone app store. This is according to reports emanating from the Nintendo Developer Conference last week, that suggest Nintendo want a whole host of useful applications that move beyond gaming. Currently the Japanese version of the DSi store only has one third party application on there – Mojipittan Shiritori Clock – the sole function of which is revealed from the last word in its title. Nintendo is hoping that developers can be a lot more creative than just that, looking into the newly added functionality of the device as a pocket media device. One early rumour anticipates a Facebook application that would allow users to upload photos taken with the handheld’s dual cameras. There’s certainly plenty of potential to work with for developers, and the creativity that third parties have shown on the iPhone would be extremely welcome on the DS. The ratio of innovative, quality software to shoddy ports and shovelware has certainly dropped significantly since the machine hit the mainstream, and some innovative third party apps could bring a little excitement back to the handheld. Of course, that promise of innovation is only for people who purchase the DSi when it’s released next month, but personally I’m looking for an excuse to upgrade anyhow.